Ce chalet pittoresque East Bay possède 230 Ft. au bord du lac avec un hangar à bateaux et d'un quai pour la baignade, le pont Lookout pour superbes couchers de soleil, kayak, canoë, Randonnée. A proximité du lac Hardy et les îles isolées. Cuisine, cuisinière, micro-ondes, 3 br, 2 jusqu'à la Reine et complète, 1 principal br niveau. 2 lits simples et 2 salles de bain 1 jusqu'à 1 niveau principal, douche et Jet Tub. Divisez niveau inférieur Sofa & 2 amour sièges. Salle à manger et salon, laveuse et sécheuse, lave-vaisselle, lecteur CD, DVD à la télévision, les mangeoires d'oiseaux, entraînement privé avec redressement, les locations Power Boat à divers Marinas à proximité. Embarcadère disponible dans le hangar à bateaux, vue panoramique, four micro-ondes, grille-pain, cafetière, bouilloire électrique, ponton et ponts, canoë, eaux peu profondes et profondes, vues de la fenêtre du lac, Wi Fi disponible, jeux de table et puzzles, jouets de plage, Baie calme, pêche, pont à mi-chemin, barbecue sur le pont avec tables et chaises, entouré d'arbres variés pour l'ombre, vue du coucher du soleil avec exposition sud-ouest, équipement de natation, gilet de sauvetage. paramètres floraux. I have rented many VRBO properties and this is my first overall negative experience. I grew up at cottages in the area and appreciate 'rustic' a great deal, but this rental was not acceptable for the price paid. The property is in a fantastic location on lake Muskoa. No boat traffic, great water areas and gorgeous sunsets. The kayaks were also a nice bonus. 1. The property is poorly maintained and has some safety issues. The staircase leading to the boathouse has no railing on the steep downhill side and the steps are crooked. The paved access is so steep it is hard to maintain footing when wet. 2. The property was not clean (and we are not a picky family). The towels and linens are very old. The BBQ was so greasy it was a fire hazard to use and had massive flare ups from many many uses since being properly cleaned. (I am a Firefighter and have seen houses destroyed by this). The patio furniture was dirty and completely soaked and had no covers or table cloths and we spent an hour cleaning the chairs and table just to make them useable without getting your clothes filthy. There were two rolls of toilet paper for a four night stay in a three bedroom place so we had to go back to town to get more. 3. The water from the taps is lake sourced and not recommend to drink and we were not informed of this by the owners until I emailed asking about it. There was no potable water supplied on site at all. Nothing was mentioned about bringing bottled water in the property description. 4.Communication with the owners was very slow. Responses from them took more than 48 hours at times by email. No texting or voice was available. The directions to the property are simply wrong as the distance description on Walkers Point Road says 3 Miles when the actual distance is Just over 1 Mile to the turn. 5. The access to the cottage from the parking loop is extremely steep. Anyone with mobility issues of any kind would struggle tremendously. Bringing in and removing gear and bags would be tough if you aren't quite fit. This was not mentioned by the owners. I struggled writing this review. I don't want to affect anyones income but certain basic standards need to be met. I hope the owners invest a few thousand dollars in maintenance and hire someone to clean it properly before guests arrive moving forward. I don't usually write reviews of places that we stay at but just wanted everyone to know how great of a property this was. The view is spectacular and the photos dont do it justice. Will be back next year! Glad you had a great stay. Most of the Photos are for the Nature of the lake and not the glitz. Beautiful Muskoka cottage with great privacy. My family and I thoroughly enjoyed our stay, and can't wait to go again. The sunsets were incredible and the cottage was supplied with everything needed for a comfortable stay. Loved the peace and quiet. Was only woken up at night by an owl nearby in a tree! Amazing site on Lake Muskoka! We spent 2 weeks at this amazing older cottage. It is on a quiet bay on Walker's Point with a spectacular western view and magnificent sunsets. 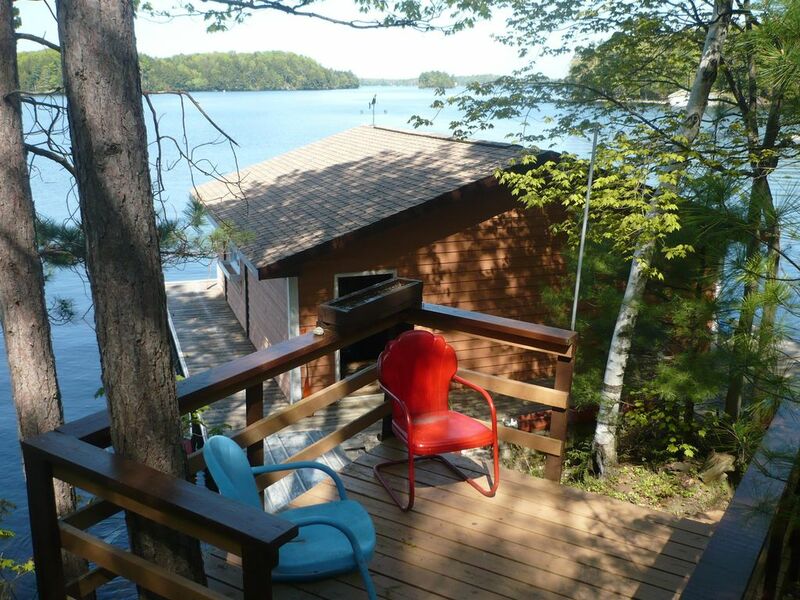 This is an older cottage with modern amenities set in beautiful Muskoka woods. It is very rustic but this is what made it so special for me it reminded me of the cottage I went to as a child. Lake Muskoka can be very busy but this area did not have the constant boat traffic that I have experienced on Browning Island. We rented a boat for the week and it was great having a spot in the boat house. Unfortunately the weather didn't co-operate and we didn't get to boat as much as we would have liked, however, we did get to boat into Bala a couple of times to indulge in Don's Bakery (an absolute must but get there early). There was a kayak and canoe which we made use of in the bay. The lake bottom was firm sand which is great for anyone who doesn't like soft bottoms. The stairs into the water could be slippery just be aware and careful. My only caution to renters is that this cottage is on a fairly steep hill which could be a problem if there are any medical issues. Over all we had an amazing time and will hopefully be back. Sunsets like you'd never image. I am a grandchild of the man that bought and built this property up to what it is today. I have been traveling to this cottege since I was 6 months old, now 26. It has been a special place for our family. There are so many wonderful things to do here and is perfect for spending time with friends and family. You can make your experience as fast pace or slow and relaxing as you choose. My favorite things to do include: laying out on the dock, swimming, canoeing to small islands and frog ponds, hiking, exploring, swimming in Bala Falls, playing cards, board games, cooking out and eating on the porch, renting jet skies, campfires, waterski shows, visiting town, farmers market, watching the sunset and starts at night and spending time with loved ones. Would not spend my vacations any other way! Cottage est éteint Renley Road. Entraînement privé. Près du lac Hardy, sentiers de randonnée et Barons Randonnée si vous arrivez de Gravenhurst, dirigez-vous vers le nord sur l'autoroute 169 environ. 15 km jusqu'à Walkers Point Rd, tournez à droite et continuez sur environ 2 km. Tournez à gauche sur Renley. Ensuite, parcourez 1,5 km et tournez à gauche au panneau Mabel Firnwood. En outre, si vous venez de l’autre direction de la ville de Bala plus au nord sur l’autoroute 169, dirigez-vous vers le sud pendant environ 12 km jusqu’à Walkers Point Rd, tournez à gauche puis sur environ 2 km et tournez à gauche sur Renley Rd. Faire 1,5 km et tourner à gauche au Mabel sighn. Bala se trouve à proximité des chutes de la rivière Moon River et du groupe Key To Bala Dance and Band. Gravenhust et Port Carling ont l'opéra et la bibliothèque. Variété de studios d'art et antiquaires. Seguin cruses de navires à vapeur, hebdomadaire spectacles de ski à Bala chaque mardi soir. magasins de boulangerie, Eglises. Santas Village, Rides et plaisir de l'eau au large de la rivière Muskoka dans Bracebidge. Régates, église de Kettles, marché fermier tous les mercredis à Gravenhurst. Minimum 3 nights except in August minimum 4 nights. Drive with turnaround. Unload luggage top of turnaround or Pull down drive to cottage.Use Emergency brake. Steep Lower incline. Seasonal availability August and September. Some Dates in June. Remodeling down Bath Shower. Clean BBQ Grill after each use. Be considerate of Neighbors.